When Kerry Carlson couldn’t find a dairy-free creamer that fit her on-the-go lifestyle, she decided to create her own. It’s said that “necessity is the mother of invention,” and that is exactly what inspired Kerry Carlson to create her own brand. After searching far and wide for a delicious, dairy-free, dried creamer that fit into her on-the-go lifestyle, Carlson realized the product she was looking for didn’t exist—yet. So, she founded Coconut Cloud, a line of 100% dairy-free, vegan, powdered coconut creamers. Read on to learn how this RangeMe Verified™ brand revolutionized the dairy-free space and landed a major retailer. As an active, dairy-free consumer constantly on the move, Carlson wanted not only a great-tasting non-dairy option, but also one that she could easily keep with her while traveling. And she knew she wasn’t alone, confident that there were other consumers out there searching for the same type of product. 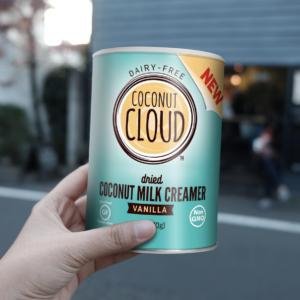 “There really was an opportunity for a dried, natural, dairy-free creamer for consumers who travel and want the convenience of a non-refrigerated product,” explains Lauren Durso, Managing Director at Coconut Cloud. “You can’t take your liter of coconut milk or cashew milk with you on a plane,” she says, highlighting one of the major issues with existing dairy-free options. Determined to fill this void in the market, Carlson went on the hunt for the best-tasting dried coconut powder, eventually finding what she was searching for in Thailand. All of Coconut Cloud’s powders are created from freshly pressed coconut milk, sourced from sustainably harvested coconuts from Thailand, in order to preserve flavor and health benefits. By offering such an innovative product that wasn’t readily available, Coconut Cloud was poised for retail success. After hearing about RangeMe and setting up their profile, Durso admits that she wasn’t sure what to expect. “We decided to create a profile and see if it worked,” she says. And “worked” it did—Coconut Cloud started getting interest from buyers on RangeMe right away. Shortly after creating their RangeMe account, a buyer from Publix reached out asking for samples. 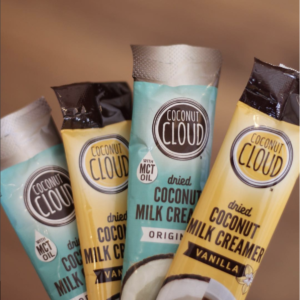 Within three months, two Coconut Cloud SKUs were available in 1,100 Publix stores. This initial success with Publix is also what inspired Coconut Cloud to get RangeMe Verified, despite their initial uncertainty. “RangeMe turned out to be a very real and very legitimate platform for us,” Durso explains. Since getting Verified, Coconut Cloud has continued getting interest from buyers and they feel prepared to secure more retailer placements through RangeMe. Coconut Cloud is looking forward to growing their product line and expanding into more retailers. They recently launched individual stick packs of their dried creamer and they are confident that this convenient, single-serving format will appeal to their on-the-go customers. They are also excited to keep adding new flavor options to delight existing customers and entice new ones. Ultimately, Coconut Cloud is determined to penetrate the retail space with their unique offerings. “We will continue to develop new and innovative products for our consumers and continue growing the footprint of our brand,” Durso says. With the power of RangeMe behind them, Durso is confident that Coconut Cloud will continue to succeed. Lila is a customer experience strategist who creates campaigns and content to engage and inform RangeMe suppliers about the latest industry trends. As the Customer Engagement Specialist, Lila loves helping brands find success on RangeMe. In her spare time, you’ll find Lila doing all of the things your grandma loves — crossword puzzles, embroidering, and reading.